I heard them all (and more) during my nine months, from friends and strangers alike. I didn’t have a lovely bump or pregnancy shape/figure – right up until the day I lay on the operating theatre waiting for the c-section. Even on the recovery ward, after the surgery, the two Nurses exclaimed “goodness just look how flat your tummy is!”. And I get it, no one meant any harm. Sometimes the comments “slipped” out due to surprise; sometimes it was just natural curiosity; others it was ‘tongue in cheek’ or in jest; and a few times people just didn’t think before they said exactly what was in their head – #nofilter, I guess! That’s life, we’ve all been there, said something silly, unhelpful or insensitive. I know I certainly have. But from about 6 months onwards I stopped telling people I was pregnant, as I just couldn’t face the questions or (un)helpful suggestions about why I looked they way I did and how I could solve it. (And no, eating more calories was not the answer). I have little pictures of my pregnancy (one or two at best) and I de-tagged anything others put on Facebook, again to save having to face anymore comments. One of my most difficult experiences was showing up at the Maternity Unit, in the Hospital, for a 28 week appointment and being told “No dear, you’re here too early”. I remember I thought she meant time wise and showed her my card to prove I was ok. She didn’t mean clock she meant date. “No, you have to be 28 weeks pregnant for this appointment”. When I explained I was 28 weeks – a few days previous – she rushed me to the Emergency Obstetric Unit, walked to the front of the queue and said “I need someone to look at this women, she says she 28 weeks pregnant and I would question the growth”. I should point out she hadn’t measured me, just looked at me. That began weeks and weeks of appointments with different HCP’s, each telling us different things about our baby’s size and “reason” for my lack of growth and visible bump display. As I waited on a bed in that Emergency Unit I remember feeling very afraid, embarrassed, ashamed and alone. I now understand all of this had a profound impact on my mental health and wellbeing. While I was diagnosed with Postnatal Depression by a GP, when Reuben was two, I have been helped to understand (thanks to therapy) that the roots of the illness took hold in pregnancy and actually I had Antenatal Depression. That went un-diagnosed (there was so much else going on) and led to severe PND, which almost took my life. Looking back on my pregnancy now, I feel very sad. I missed out on so much – joy, fun, preparation and planning. I felt so disconnected from my body, myself and my baby. I remember just wishing it would all be over. I never had a “glow” about me. I never wanted to talk about the fact that I was expecting a baby, except with a few people who knew we were having a difficult time. I also wish I known and understood more of how our emotional & mental health wellbeing can be impacted right from pregnancy and onwards – maybe my story and journey would be different. 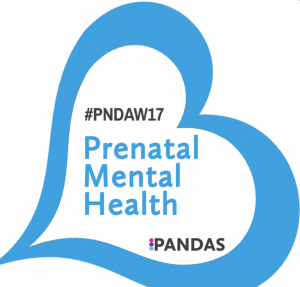 This week the wonderful people PANDAS Foundation are highlighting Prenatal mental health (i.e in pregnancy) via their awareness week and I’m adding my voice to join them. The more we share & the more we know, then the greater the awareness. ← I was labelled as an “over anxious parent”.